The Assyrian Evangelical Church is a Presbyterian church in the Middle East that attained a status of ecclesiastical independence from the Presbyterian mission in Iran in 1870. Its members are predominantly ethnic Assyrians, an Eastern Aramaic speaking Semitic people who are indigenous to Upper Mesopotamia (what had been Assyria between the 25th century BCE and 7th century CE), and descendants of the ancient Assyrians. (see Assyria, Assyrian continuity and Assyrian people). 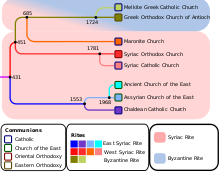 Most Assyrian Evangelicals (as well as members of the Assyrian Pentecostal Church) had initially been members of the Assyrian Church of the East, its later 18th century offshoot; the Chaldean Catholic Church, or the Syriac Orthodox Church, before conversion to Protestantism. The vast majority of ethnic Assyrians remain adherents of these ancient Eastern Rite churches to this day. There are several Assyrian Evangelical churches in the diaspora, e.g. in San Jose, Turlock, and Chicago. In 2010, one of its Iranian pastors was arrested in Kermanshah and detained for 54 days for allegedly attempting to convert Muslims to Christianity. ^ Vander Werff, Lyle L. (1977). Christian mission to Muslims: the record : Anglican and Reformed approaches in India and the Near East, 1800-1938. The William Carey Library series on Islamic studies. William Carey Library. p. 366. ISBN 978-0-87808-320-6. ^ Cole, Ethan (Mar 31, 2010). "Jailed Iranian Pastor Temporarily Freed, In 'Good Spirits'". The Christian Post. Retrieved 2 May 2010. This page was last edited on 7 April 2019, at 15:11 (UTC).